Workplace Bullying: How Should You Respond If You See Bullying? Are You Supporting In By Your Silence? 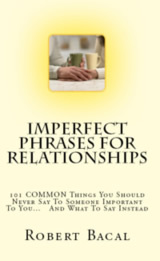 It's a lot easier to learn from Imperfect Phrases For Relationships if you have the entire book in your hands. And, the price is low. The book is available in print, in Kindle format, and in an instantly downloadable version (PDF), which is great if you are in a hurry. Below are the links so you can get your own copy, or better yet, get two copies, one for each of you in your most important relationship. Robert's books have sold over 300 thousand copies worldwide, and have been translated into Chinese, French, German and Japanese. He holds a Masters Degree in Applied Psychology, and has taught clinical and counselling psychology at the college level. You can browse his Amazon Author page by clicking the graphic above. Bacal & Associates is a small training, consulting and publishing company specializing in government. Founded in 1992, we have been serving government training and consulting needs for 22 years. We focus on customer service, communication, performance management, and other management challenges within the public sector. Help, tips and advice for dealing effectively with conflict in families, or at work. Our main site with over 400 articles on life in the workplace. Whether you are an employee, a manager, or an HR professional there's advice and tips on how to be more successful at work. While some companies try to engage visitors with fancy graphics and videos, we've committed to being a content centered, advice oriented company that can provide you with the advice, tips, and information you need and want about building better relationships. We limit the use of graphics and stress quality content. We also believe in a NO HYPE environment. Our product and service descriptions are free of overblown claims, and selling. Copyright © 2000 - 2015 Robert Bacal. All Rights Reserved.